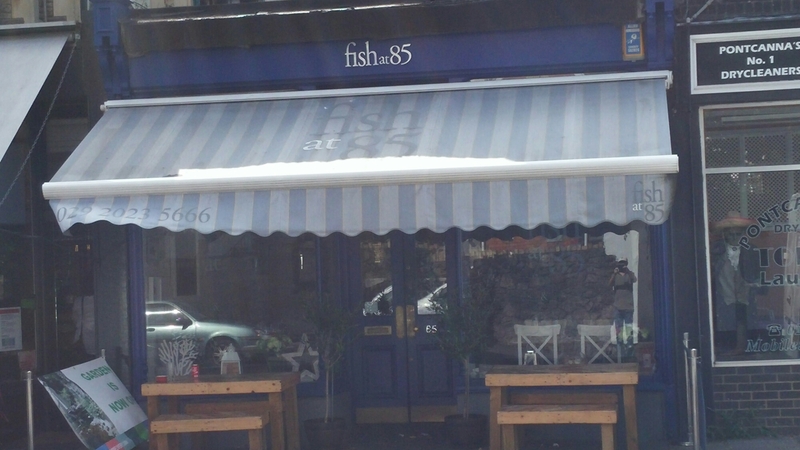 Seafood Sunday – Fish at 85, Pontcanna, Cardiff. UPDATE: May 2018 closed until further notice. Roast dinner of a Sunday is seen as quintessential part of being British. A classic combo of roasted meat and veg, which we are all perceived to tuck into at the end of each week (or the start, depending on your perspective of Sundays). The French even call us Les Rosbifs in light hearted mockery of our obsession with the Sunday roast. Inside it is very New England. Fish/seaside paraphernalia adorns the walls, with both paintings and other pieces of artwork. I like that sort of stuff so it is to my mind a good looking space. It was a bit quiet on our visit and the casual passer by could be mistaken for thinking it was closed (we where the only diners when we arrived). I think some more obtrusive signage re their Sunday lunch offering wouldn’t go amiss. For non fish eaters (not sure why they would go to a fish restaurant but veggies have non veggie friends and partners I suppose), there is a veggie option and a meat option. Still seems odd to me to go to a place like this and not have the fish, but heyho. Slightly annoyingly there are supplements at each course on what is not a huge menu, which are quite hefty (if had the supplement laden options it would take two courses up from £15.95 to up to £25.95 and three courses up from £19.95 to £32.95). My view (espoused many times on this blog) is a fixed price menu should be just that, fixed with no supplements. There are plenty of fish in the sea, so to speak, to populate a short menu without the need to resort to stuff that has a base wholesale price so as to warrant a supplement. Anyhow enough of the moaning and on to the actual food. 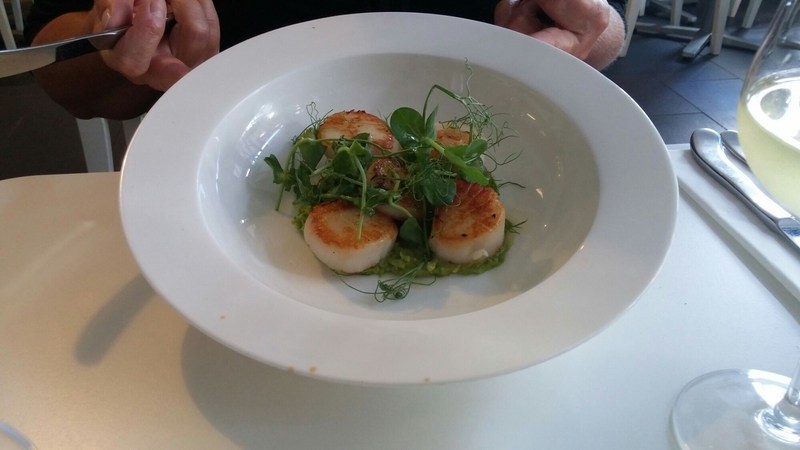 My only gripe was the supplement it attracted and I would have been happier (as the paying person rather than eating person) if there had been 3/4 scallops (rather than the very generous 5) and no supplement. I went for the lobster Bisque. This was a really good rich soup. 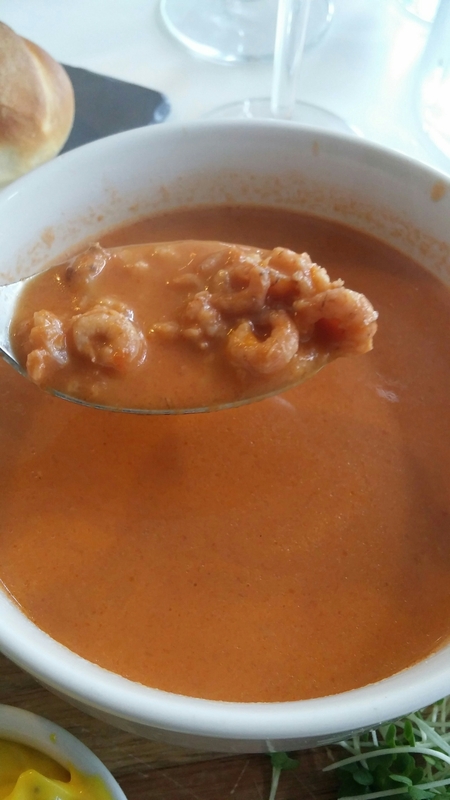 Full of flavour (from a very good base stock) and packed to the gunnels with copious quantities of brown shrimp. The advertised crayfish was less evident but there nonetheless. 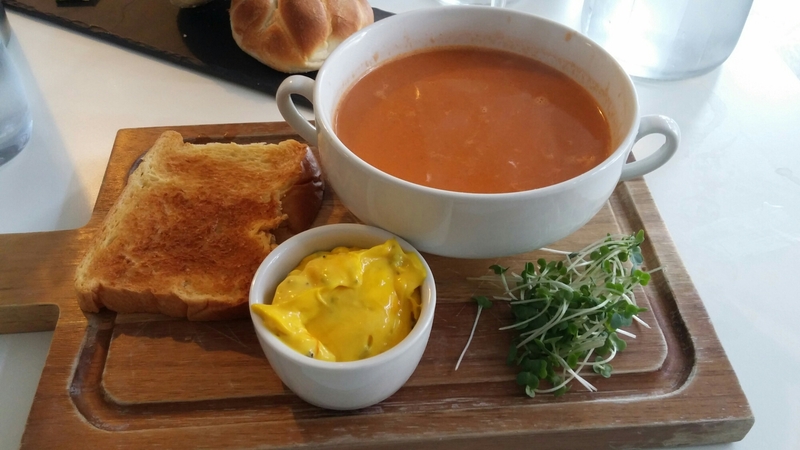 What was a cracking soup came with a pleasant rouille and brioche toast. My only very slight qualm was the brioche toast, which was quite sweet as against the sweetness of the bisque from the crustaceans. 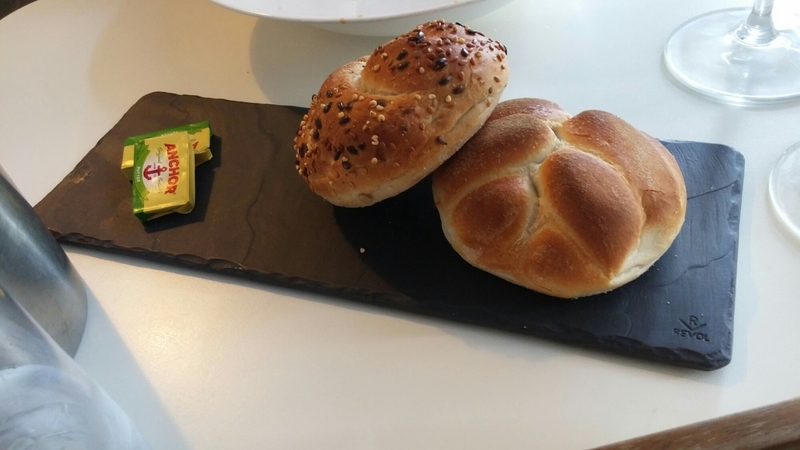 We ordered bread with the starters (very nice, but a bit steep at £2.95 and I would have expected them for that price to have taken the butter pats out of their wrappers), which I thought went better with the rouille and soup than the brioche. On to the mains, Mrs. SF went for one of her all time favourites in the form of seabass. Two, perfectly cooked, large fillets with crispy skin and seasoning that was absolutely bang on the money. This came with a lovely sauce vierge and a very refreshing radish and fennel salad. Portion wise this would have been more than enough, but the dish also came with skinny fries. Nice, but perhaps just a tad more fryer time needed to make them crisper. 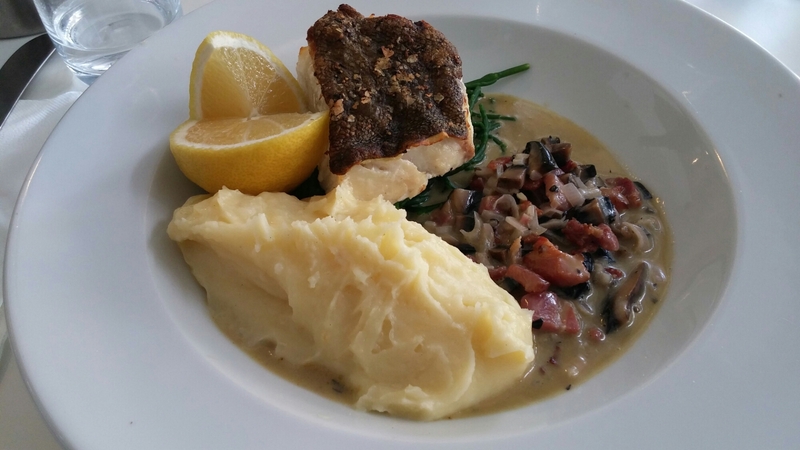 I had the baked cod fillet with a smoked bacon and mushroom butter sauce, samphire and mash potato. As with the seabass the cod was perfectly cooked and seasoned – a really lovely bit of fish this. The sauce added a nice buttery, earthy, smokiness to the proceedings. Underneath the cod was some crisp, but tender, samphire. In my experience, samphire can sometimes be a bit woody, but these were very tender shoots. The final component to this dish was a good portion of lump free tasty mash. All in all two very good main dishes. 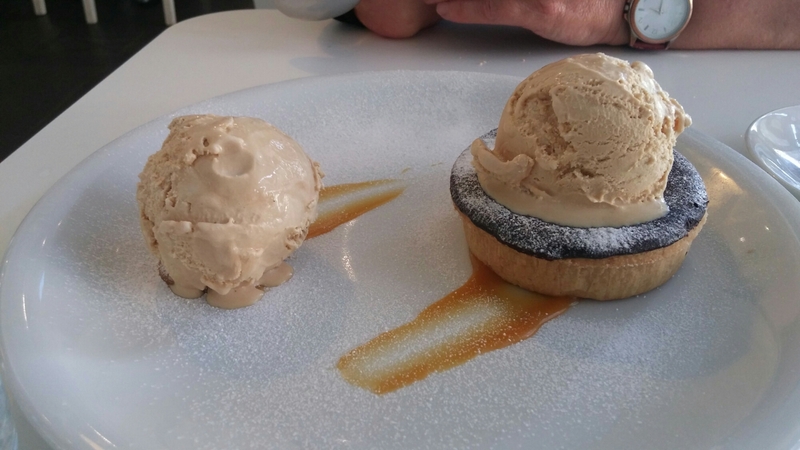 As the portions were quite large, we decided to share a desert. This was very nice with rich dark chocolate and a good ice cream (we got two rather than the normal one scoop according to the waitress). A touch more saltiness to the caramel sauce being needed would be my only minor quibble here. 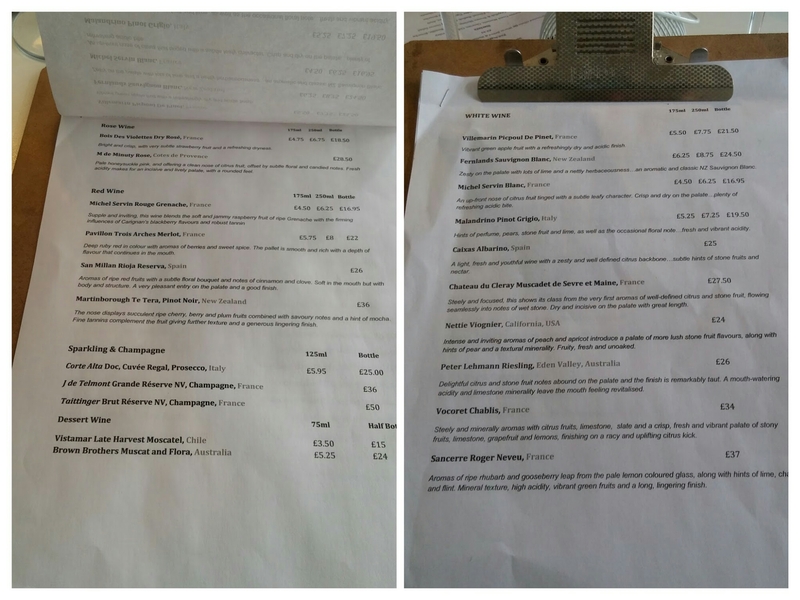 The wine list has a decent enough selection of whites, reds and fizzes with prices ranging from just under £17 for a Servin Blanc to £50 for an NV Tattinger. 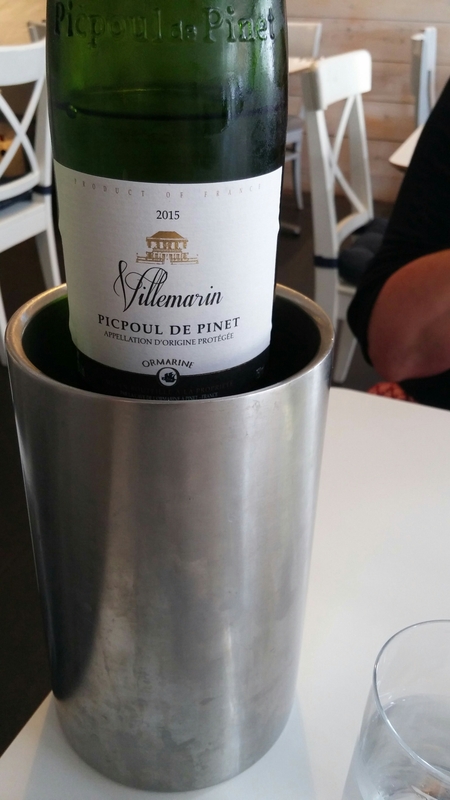 We went for a Picpoul de Pinet, a Languedoc wine I have reviewed on the blog in the past (click here for that review) and which is available at Majestics. Nice wine this, with lots of citrus and crisp acidity, priced at £21.50 (retail it is £8.99 or £7.49 as part of a mix case of 6). 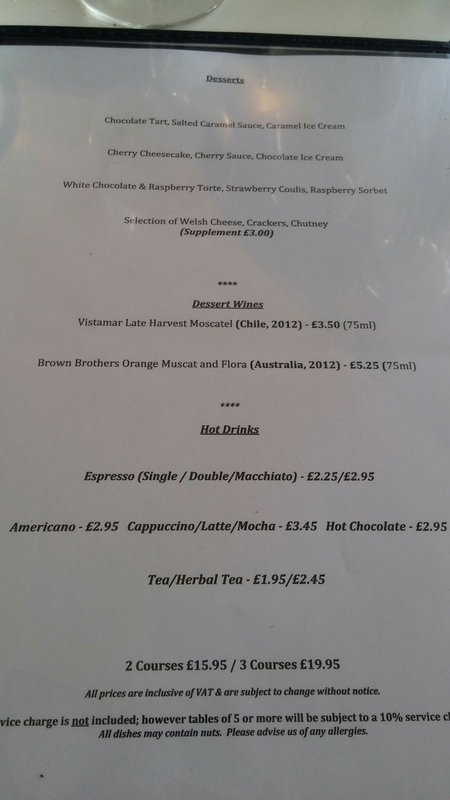 It seems a shame that only a few wines on the list are available by the glass. I would also have liked to have seen some sherries on the list. Finos and manzanillas have a great affinity with seafood. For non wine drinkers there is a short selection of beers and ciders, as well as a reasonable if slightly uninspiring soft drinks offering. Bar from a few niggles (the supplements and some of the pricing), I was very impressed with the Sunday lunch at Fish at 85. Perfectly cooked fish made for something deliciously different from a standard Sunday roast dinner. 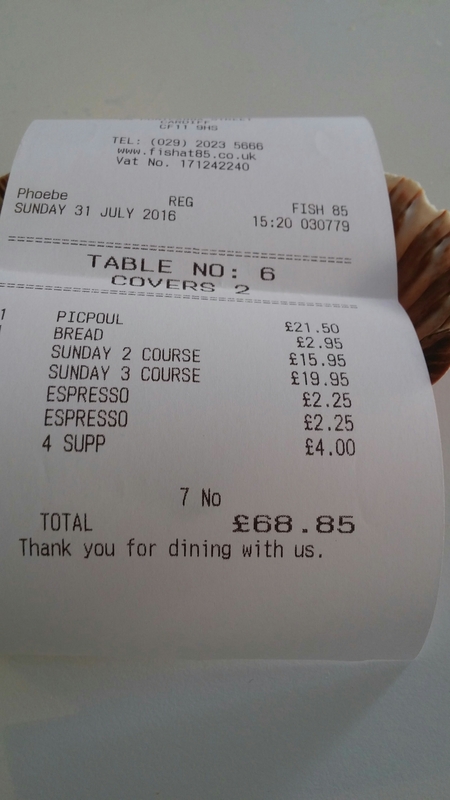 Price wise we paid, all in with wine and coffees, just shy of £69. Not cheap I grant you, but I thought well worth it. Service was very good and deserving of the tip we gave. Would I go back? 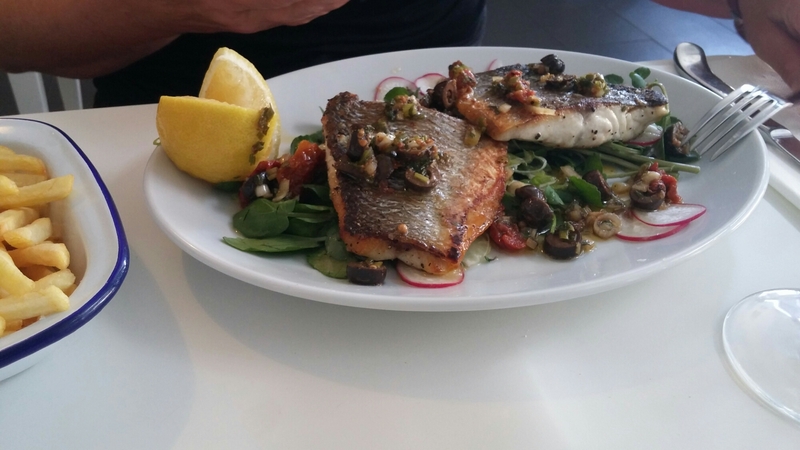 Yep – nice change from the Sunday norm and this place certainly knows how to cook fish. I note from their Facebook feed that they are now doing a “Tapa Tuesday” which looks interesting. Tues – Sat: 12.oo – 14.30 and 17.00 – 21.00. 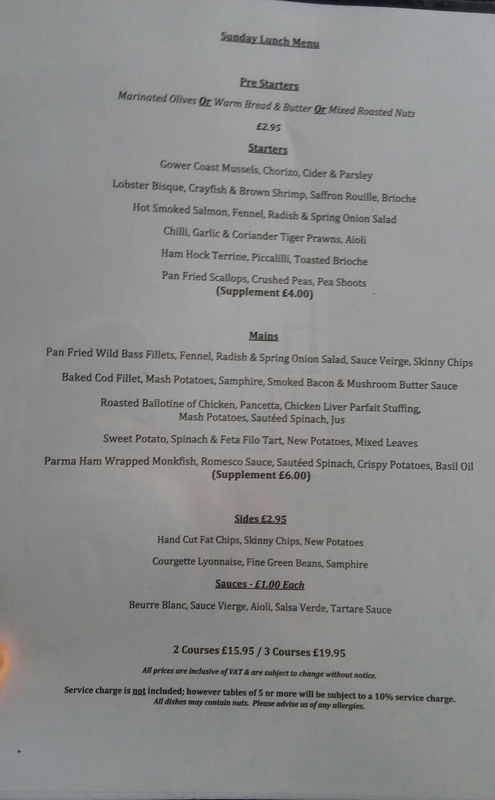 This entry was posted on Aug 7, 2016 by solicitingflavours in Alcoholic drink, Alternatives to sauvignon blanc, Cardiff, Cardiff restaurant, desserts, Drink, fish, Fish at 85, Fixed Price Menu, Food, Food and wine products, French wine, Ice cream, lunch, lunchtime, Muscadet, Picpoul de pinet, Pontcanna, Red Wine, Restaurant Review, review, Sunday lunch, Wales, White wine, wine, wine mark up.